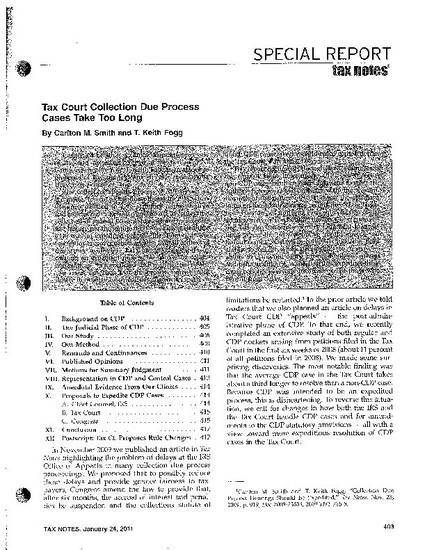 This report documents through Tax Court records the time it takes to complete CDP cases versus non-CDP cases and then offers solutions to what the authors perceive as a problem with the system. Because of the nature of CDP cases, the solutions focus on the administrative record preceding litigation. They do not stop with early introduction of the administrative record during the Tax Court proceeding, but also concern summary judgment in situations when the administrative record reveals no factual conflict. Delays in collection hurt the IRS's ability to collect while decreasing the taxpayer's ability to climb out of the financial hole as interest and penalties mount. A solution that expedites these cases benefits everyone involved except those who benefit from delay.